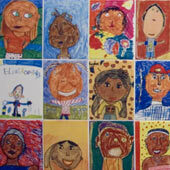 I heard about “Artboy68” blog 100 Portraits in 20 Weeks from a wonderful blog Draw and Shoot by Canadian artist and photographer Karen McRae. She was portrait number 39. Yesterday I received an email from Scott telling me I was portrait 67. He sketched my blog profile picture and posted it on his site with some really nice comments. Thank you, Artboy. This is portrait 67 of 100. I might just catch up this week. Go here to see my other portraits, or learn more about this project. 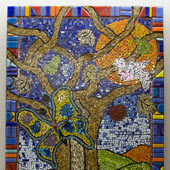 Healing and transformation is a regular occurrence at Detroit Medical Centers Childrens Hospital. Coming from the hands of artists from Pewabic Pottery? via Pottery and paintbrushes bring healing to hospitalized kids- Artserve Michigan. For Serra and the Healing Arts Team (volunteers, child life specialists, nursing staff, and artists) things are beginning to pay off. “We’re starting to hear from physicians who are impressed with the program,” said Serra. Recently, a physician stopped by to watch an artist work with a child. “The doctor was really moved to see the child doing what any other child would be doing,” said Serra. I saw the photograph I had taken of it as the tram I was riding passed by in the distance. The sculpture, called “Male/Female,” is located at the Frederik Meijer Gardens and Sculpture Park in Grand Rapids, MI. It was crafted in aluminum by American artist Jonathan Borofsky in 2001 and is several stories tall. It just seemed jarring, juxtaposed with the wild grasses of the gardens. When I downloaded the picture, I was shocked. The sculpture seemed to blend into the gray, cloudy sky, softening the edges, making her look vulnerable against the elements. I couldn’t stop staring it, thinking it like a women, standing tall in the face of the world. It is amazing…the power of photography.